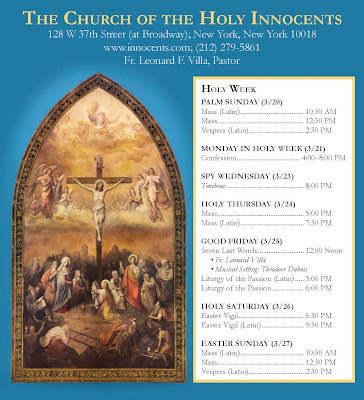 As is tradition every year, Holy Innocents will have the Holy Week ceremonies according to the older liturgical books. In addition to the ceremonies noted on the poster below, Masses will be celebrated on the Monday, Tuesday and Wednesday of Holy Week at 6 p.m. The church will be open throughout the evening of Holy Thursday. Particularly noteworthy is also the traditional preaching on the Seven Last Words on Good Friday, which will be accompanied by the music of Théodore Dubois.